and for ordering outside the UK. 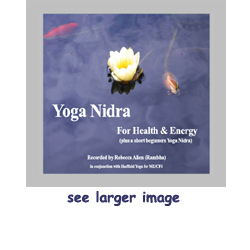 This yoga nidra CD was recorded by Rebecca Allen (Rambha) in conjunction with Sheffield Yoga for ME/CFS and devised by Paramahamsa Satyananda Saraswati. Yoga Nidra (meaning yogic sleep) is a very deep form of relaxation. The CD contains a brief 3 minute introduction to Yoga Nidra and the resolve, followed by a short 22 minute Yoga Nidra suitable for beginners or those with little time, followed by a 34 minute Yoga Nidra for focussing on building health, energy and balance in life. The second Yoga Nidra is suitable for both people with health conditions who wish to support the healing process or for healthy people wishing to focus on energy and inner strength. Rebecca is an experienced Satyananda Yoga teacher and has a very calming voice. Yoga Nidra (meaning yogic sleep) is a very deep form of relaxation, in fact it is one of the most powerful forms of deep relaxation available. To do yoga nidra, all that one needs to do is lie down, keeping as still as possible, and listen to the instructions. It is usually done lying down on a folded blanket or mat on the floor, but it can be done lying down in bed (although it is harder to remain awake in bed!). Yoga Nidra produces relaxation at the physical, emotional and mental levels, bringing about harmony and balance. It is said that one hour of Yoga Nidra is the equivalent of four hours sleep. Yoga Nidra is believed to be able to relieve insomnia and sleep disturbances, assist pain levels and have a balancing effect on the different dimensions of the brain. It is also generally accepted that deep relaxation produces many beneficial physiological changes in the body, including balancing the central nervous system, strengthening the immune system, normalising blood pressure, and more efficient respiration. For more information on Yoga Nidra and references please refer to the article "Yoga Nidra for those with ME/CFS" by Rebecca Allen (most of this article is about Yoga Nidra in general and is applicable to everyone, not just those with ME/CFS) which can be found here . The CD is suitable for those who are beginners in Yoga Nidra and those who have more experience of the technique. Rebecca suggests that beginners in Yoga Nidra should listen to the beginner’s Yoga Nidra on Track 2 first for a few weeks, before moving onto the longer Yoga Nidra on Track 3. Rebecca is an experienced Satyananda yoga teacher with many years experience of practising and teaching Yoga Nidra. She teaches therapeutic as well as general yoga classes in Sheffield and also takes some classes for Sheffield Yoga for ME/CFS. All of her classes include Yoga Nidra. Rebecca"s teacher training research project was on endometriosis and Yoga Nidra in relation to healing generally. She has a very calming voice. Her website can be found at www.yogabreathmeditation.co.uk/ . The easiest way to buy it online is by clicking the button near the top of the page and buying online using Paypal (if you are in the UK). You can do this whether you have a Paypal account or not. The CD will also be available for sale at classes run by Sheffield Yoga for ME/CFS. You can find different ways of ordering here.